Make smelly towels a thing of the past with this one household product. It's that easy! Have you ever come out of a shower all fresh and clean and suddenly catch a whiff of something sour? It's probably time to give your towels the sniff test and wash that stink away. TODAY Home asked Carolyn Forté, director of home appliances, cleaning products and textiles at the Good Housekeeping Institute, for tips on how to clean smelly towels. Her secret ingredient? Distilled white vinegar. 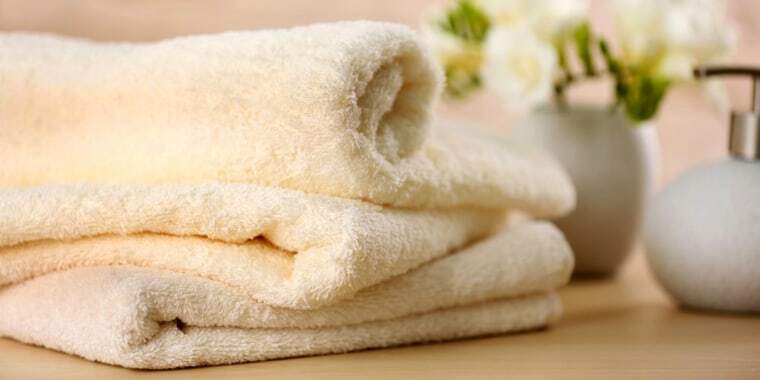 Towels develop a sour and smelly odor when they’re put away wet. Another source of towel odor, and also the reason towels lose softness and absorbency, ironically comes from detergent/fabric softener buildup. So when you notice a musty or sour smell in your towels or they lose softness and absorbency, Forté recommends adding one cup of distilled white vinegar during the final rinse (for a standard top-load washer that fills with water) to remove the odor. This article was first published on June 30, 2016.